Code Tester for Oracle 3.3 is now GA! Please note: Although Code Tester for Oracle is a part of Toad for Oracle Developer Edition and is normally released with Toad, v3.3 is an intermediate release and, as such, is available as an MSI installer. It can be used to upgrade Code Tester v3.2 (part of Toad for Oracle Developer Edition 2017 R2). A valid support & maintenance contract is required to download the software. 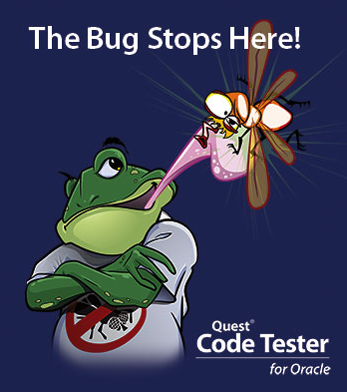 Don't forget, you can leverage the power of Code Tester for Oracle inside Toad's Editor. Use this to get started with unit testing by creating some simple, reusable tests. Once you're comfortable, move over to Code Tester and start by using Run-to-Test, and before long, you will be a PL/SQL testing guru! If you are involved in bringing Oracle database development and change management operations into your agile and DevOps processes, check out our new Toad DevOps Toolkit blog. I'm looking forward to participating in some interesting discussions and Q&A and the Code Tester team is happy to help you.